The challenge is to use the 2 fabrics provided plus a max of 5 other fabrics to make a quilt between 80-160 inches in circumference. There is no theme. 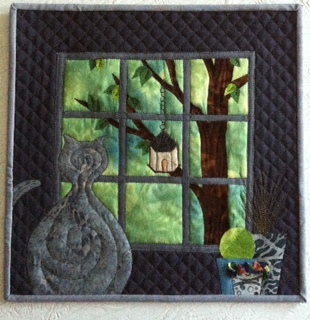 50 challenge kits were sold, so there will be a very good selection of art quilts to look at and bid on. 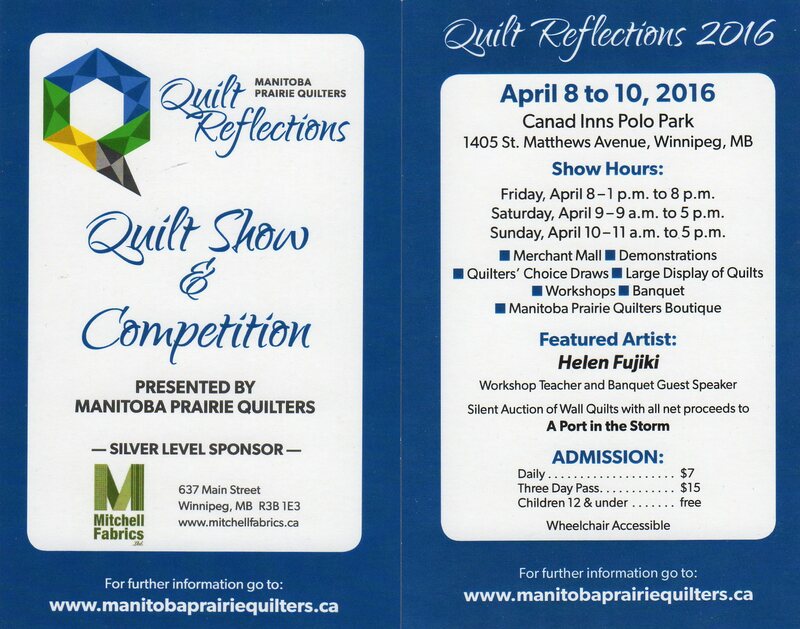 All quilts will sold by auction at the Quilt Reflections Quilt Show April 8-10, 2016. Proceeds will be donated to A Port in the Storm. This organization helps people in rural Manitoba and Northern Ontario with accommodation while they are having medical treatment in Winnipeg. They currently have to turn people away because they are full to capacity. They have purchased another building and the funds raised will help A Port in the Storm renovate their new building. 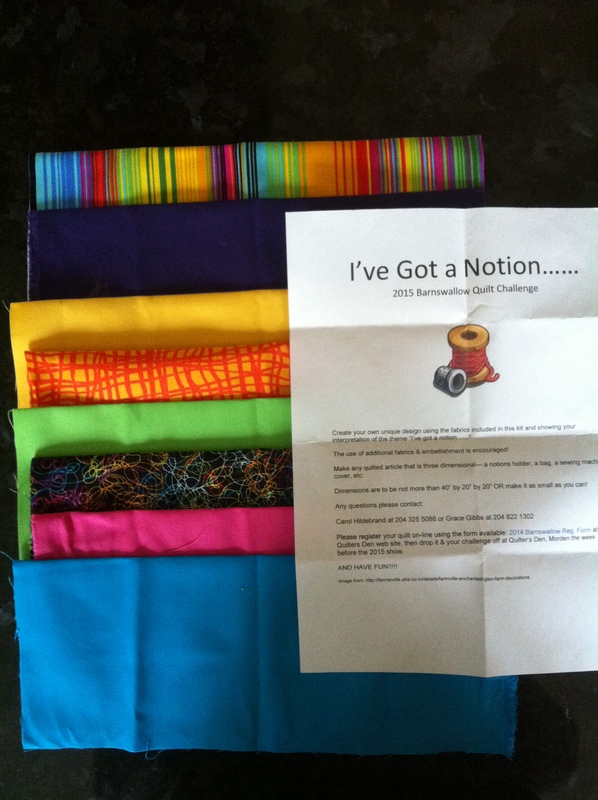 Last year I signed up for Barnswallow’s Quilt Challenge 2015 – “I’ve Got a Notion”. The challenge was to create a 3D notion, using the fabrics given. At the time, we were traveling a lot and I was hand stitching hexi’s while sitting in the passenger seat of a car. 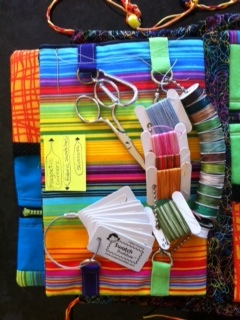 Even though I had everything in a ziplock bag, it was time consuming to stop, put the needle down and rethread it. I would have to dig for the thread, for the scissors. 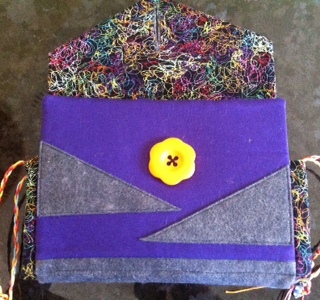 My notion was a travelling needle book that I called a Hexi Holder. It has a needle page, a thread page, protector pages to keep fabric pieces from becoming wrinkled, and includes both open and closed pockets. It opens up flat so that it can lay on your lap – perfect in small confined places like airplanes, and cars. I used it on several holidays this winter and loved having everything in one place. The page protectors are magnetized so I was able to put down the needle whenever I desired without loosing it. I was also pleased to go through almost a dozen airport security terminals without any problem. I was thrilled to receive 1st place (Viewer’s Choice) at the 2015 Barnswallow Quilt Show. In February 2016 I had the privilege of going on a Quilting Cruise with Sew Many Places. Several weeks prior to the cruise we were sent 3 fat quarters. We were to use those 3 fabrics in addition to any others we wanted in order to make a 12″ finished block on the theme of HOME. I had known the theme for a few weeks and had some ideas but once I received the fabric in the mail, I just couldn’t make it work. It was time to come up with Plan B.
I love cats and can’t imagine our home without them. Our senior cat is Jasper, an orange tabby who is 20. The fabrics I received did not suit him, but they did suit Jake. Jake was a greenhouse cat. He lived in the greenhouse for the summer and came to live with my son for the winter. Both cats loved to sit on the sofa for hours on end, looking out the window. Were they dreaming of warmer weather too? On the other side of our window is a cedar tree. It is the home to many birds, especially in the cold winter months. It may be warmer in the tree but it is also an ideal spot to torment cats! 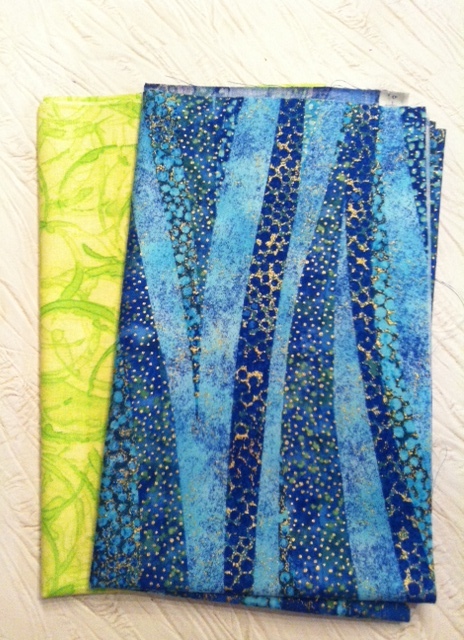 The 3 fabrics I was sent were used for Jake, and 2 of the flower pots. Jake won the Viewer’s Choice Award and was featured in the April issue of the on-line craft magazine called Craftposium.